The Swivl C Series base and marker are both powered by built-in rechargeable batteries. To charge the Swivl base, plug the wall charger into an outlet. Then plug the USB-side of the base charger into one of the USB outlets on the wall charger. Plug the other end of the base charger into the small circular outlet near the bottom of the base. Placing the marker in the back dock of the Swivl base. Plugging the marker charging cable into the wall charger and into the 3.5mm jack on the side of the marker. 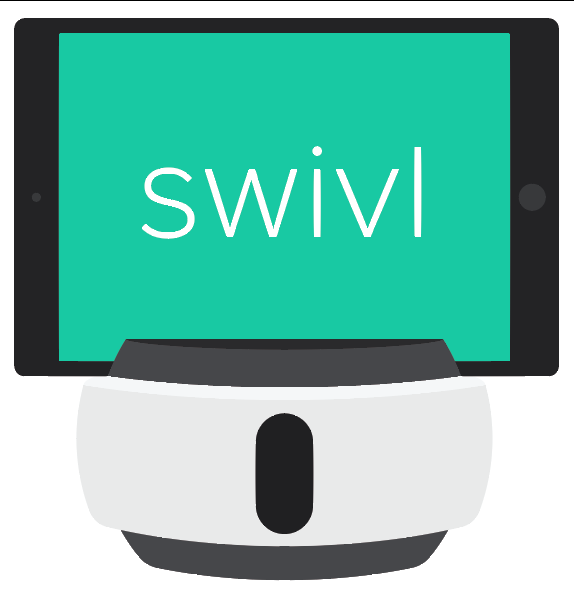 The Swivl C Series has a battery life of 5-6 hours under normal use cases. When the Swivl Robot is fully set up with a compatible mobile device, you can check the percentage of battery left on either the base or marker from within the Swivl app settings. The Swivl C5 Kit includes everything you need to charge the Swivl base, Primary Marker, all 4 Secondary Markers, and the mobile device all at once. You can use the USB charging block (pictured below) to charge your base (base charging cable), and markers (two marker charging cables are provided with C5). Your final marker (the primary) will charge in the base as shown below. You'll have one additional USB slot available in charging block for your mobile device to charge simultaneously.